This is going to be the shortest stitch tip I’ve probably ever written. If you know me and you’ve been following along on Needle ‘n Thread for a bit, then you know I tend to blather too much when it comes to embroidery. This one won’t require a whole lot of blathering. The question that came in has to do with fuzz and thread length when embroidering. And it’s a good reminder for experienced stitchers and newbies alike. Mary, I read something about thread length on your blog and changing the thread when it needs to be changed. I cut my cotton DMC embroidery floss about 18 in. long. The thread looks ok while I stitch, but there’s sometimes fuzz around the stitches. Sometimes it happens after I’m only halfway through the thread. Should I really be changing the thread every 9 in. Is that normal? The stitches look ok, but I end up picking out fuzz with tweezers when I’m finished. It shows up in photos better than the naked eye, but sometimes I can even see it with the naked eye. Does this have to do with the cotton thread? How do I eliminate it? As the needle and thread pass through the fabric, the eye-end of the thread takes a beating, and it will start to fuzz. 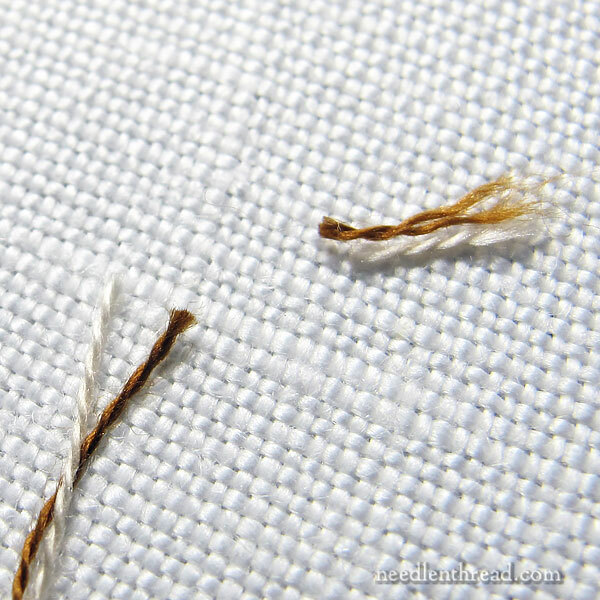 As you pass through the fabric the fuzz leaves little shards around the beginning and ends of stitches. If the shards are long enough, they’ll often leave a “glow” of fuzz around otherwise perfect stitches. 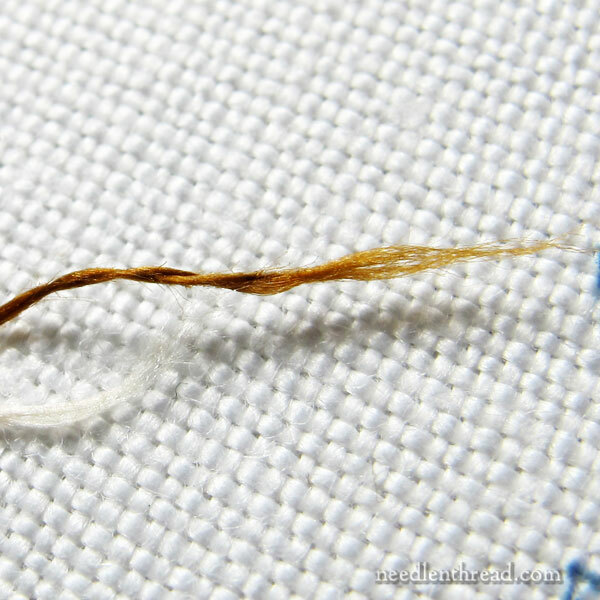 This happens with any stranded cotton and with other embroidery threads, too. You won’t normally see it with threads made from filament silk, but you will see it with spun silk, with wool, and with other types of cotton threads. The fix is simple. 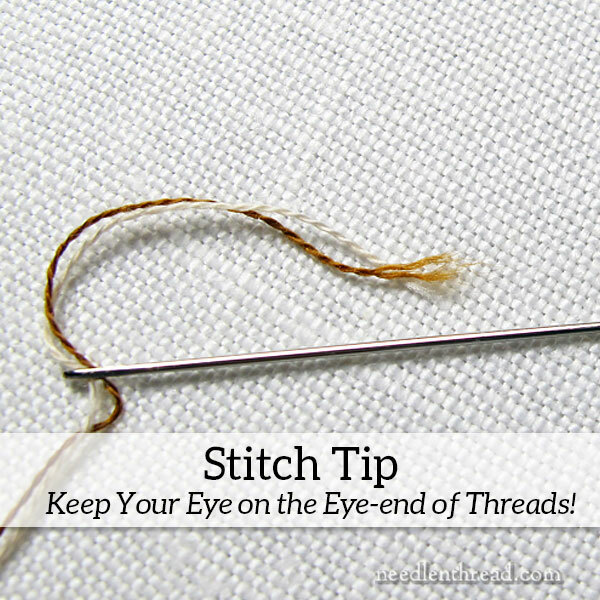 Keep an eye on the eye-end of your thread, and trim the ends occasionally to remove the fuzzy bits. Now, if the working thread starts loosing its noticeable twist or its sheen and it’s getting fuzzy on the working length, then you need to switch out the entire thread. But if the thread still looks good, just trim it! That’s SUCH a great tip – I wouldn’t have even thought of the problem being caused by the end of the thread like that. Thank you! Hi, Dianne – yes, when you’re going through two layers of fabric, the thread does wear more quickly. I’d increase the size of your needle slightly. That will take care of it. My DMC thread is about 16 to 17 inches and I have never noticed any problems. For silk I use shorter lengths. This is an excellent tip! Thank you very much for sharing your tips with us. I’ve found that if my needle is too small, that is, doesn’t make a big enough hole in the fabric for the thread to slip through, the fuzzing and fraying is worse. If the thread ‘pops’ through the fabric, the needle is too small and the thread will get twisty and try to knot up, and the ends will fray. Another way to tell that the needle is too small is if it’s hard to thread – I like to use a threader… it should slip right through the eye of the needle. I usually work Brazilian embroidery, with rayon thread and milliners needles, but also use regular embroidery floss, like with Carolyn Pearce’s “Home Sweet Home” embroidered workbox. But there are some threads that just fuzz up no matter what. That’s a good point, Marty! Yes, changing the size of the needle will help keep the fuzzing to a minimum! Big nor’easter coming in, I hear! Good excuse to stay in and stitch! I have never known you to blather on in any of your posts, I find them helpful, inspiring and useful. I will remember this next time I see fuzziness in my thread, what a great tip I never thought to cut the end of the thread to stop the fuzziness. Thank you for sharing the fuzziness solution with us and for the photos. Hope you have a great rest of the week stitching. Why did I never think of that!? Thanks Mary! Wow, I’m laughing at myself right now … I’ve always kept these fuzzy ends trimmed mainly for my OCD (crazy I know but for some reason that always bothers me…) but also to make rethreading the needle easier. Who knew I was also de-fuzzing my stitching at the same time!?! Thanks for the affirmation Mary! Is that even possible? On a blog that features, you know, EMBROIDERY??? You don’t blather, Mary. You never blather. I’ve been reading this blog for years and have never thought you blathered. Thanks, as always, for the tip! Such a simple fix! I had already started clipping the eye end thread but now I know why. Thank you Mary. Ha! That’s it! I have this fuzzy eye-end in my sight all the time – why didn’t I ever conceive of simply snipping it off?! And I never heard you blather! For me, you can’t talk enough, it’s always interesting! Thanks Mary! This was just what I needed to know. I’ve been doing some Hardanger with #5 and #8 pearl cotton and noticed the blocks getting fuzzier as I went along but didn’t want to make my thread too short because the satin stitch uses it up so fast. It seemed to me that the #5 got a fuzzy end very quickly, much quicker than regular floss. Hi, Karen – be careful, though – the thread could also be wearing. If it’s losing its sheen, I’d definitely switch to a new thread. It’s more work, but in the end, it will look better! Mary – you don’t mention the “nap” of the thread. Pearl Cotton on the little spools is easy as you thread it from the bobbin. But with floss or any fibre that come in a skein, it is important to ensure that you check the direction of the nap and have all the fibres continue to lay flat as you pull the thread through the fabric. Hi, Shirley – with wool, you can do the same thing. But you’ll also need to work with shorter thread lengths. Also, a slightly larger needle will help the wool thread keep from fuzzing more quickly. I like to use a chenille needle with wool.